Small actions lead to large results. Let’s apply this thinking to goal setting. I prefer large but attainable goals. Our goal at Harvest Profit is to help farmers add $10 billion to their net worth over the next 20 years. Yes, this sounds outrageous but give me a minute to walk through the logic of it! Let’s break that goal down into smaller pieces to see if it is actually as outrageous as it sounds. Once again, small actions lead to large results. While estimates vary, there are approximately 300,000 full-time crop farmers in the US and Canada. Let’s assume 10% of these full-time farmers will read our blog and email newsletter at some point. Futhermore, let’s assume that 50% of these producers will take away some actionable ideas from our free content, our farm mangement software, farm business courses, and consulting. That leaves us with 15,000 producers that will read or use something we produce with the majority of those not paying us a dime (and that’s ok with me!). I’ll make the simplistic assumption that the average producer farms 1,000 acres. Now it’s time for some math. In order to add $10 billion of net worth, I’ll assume that we’ll need approximately $15 billion in increased profitability. That sounds like an insanely high number. Is it? Let’s dig in further. There are three ways to increase farm profitability. While I think our business-minded approach can help a farmer seek out ways to increase the ROI on their agronomy investments, we’re not agronomists so I’ll leave that variable alone. 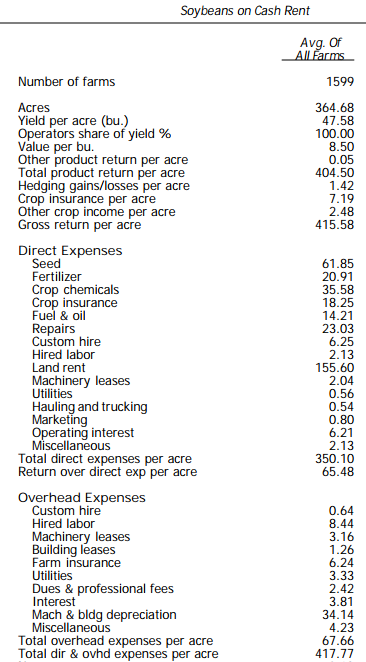 Let’s review the current revenue/cost structure for an average soybean crop. How can we acheive this $50/acre increase in profitability? The follwing math works better on corn/wheat but we’ll use beans to be conservative. I will admit that this is overly simplistic but lets assume a 5% decrease in expenses and a 5% increase in price. A 5% increase in price and a 5% increase in price led to a $44.30 increase in profitability (+170.4%!). Now it’s time to break out my favorite Excel feature, the Data Table. See below for changes in profitability under different levels of change in price and expenses. The goal of this post isn’t too preach about how Harvest Profit can magically make farmers more money. It’s to show the power of many small incremental profitable decisions. Many small decisions can lead to big results. Here are some small examples. Implement one of the five cost cutting actions from this blog post. Build a grain marketing plan to capture one extra marketing opportunity per year, as profiled here. Don’t let an inverted market “pick your pocket”. 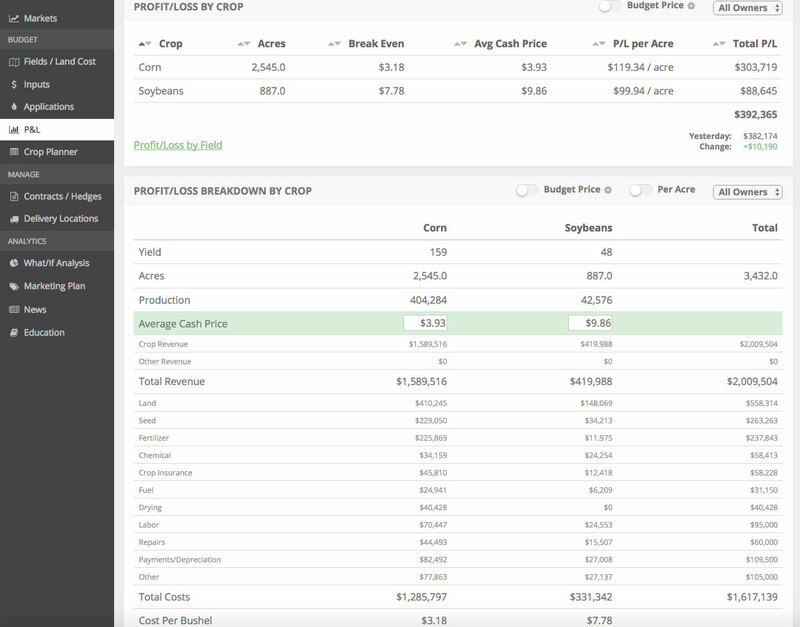 Maximize your grain storage ROI by seperating your basis and futures transactions. Very few sole decisions will make your farm that extra $50/acre in profit but I bet you can find many that will make you an extra $.50-$2.00. Those quarters and dollars add up when multipled over many acres and many years. Dust off your magnifying glass and find a few of those this year on your farm! By the way, our goal at Harvest Profit is to actually add $10 billion of net worth to producers in the US and Canada. It sounds crazy and obviously won’t be easy but we’re dedicated to providing farmers with value-added content, tools, courses, and consulting. Hopefully you can take something actionable out of what we provide.